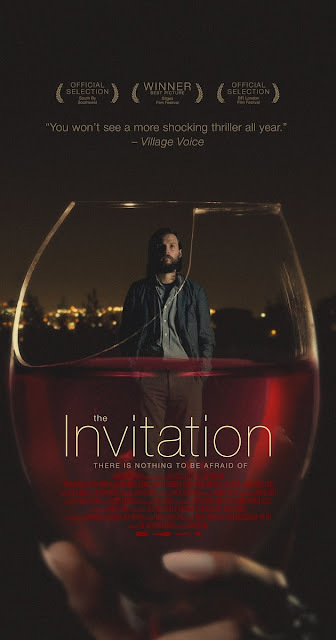 Right off the bat I am going to say I don't really know how I am going to review this, much of The Invitation's one hour forty minutes run time it is one thing but becomes something else entirely. I guess if I had to compare it to anything it would be a Shakespeare play. Now I've never been to a dinner party, but bizarrely despite The Invitation being very tense I now kinda do want to go to one. 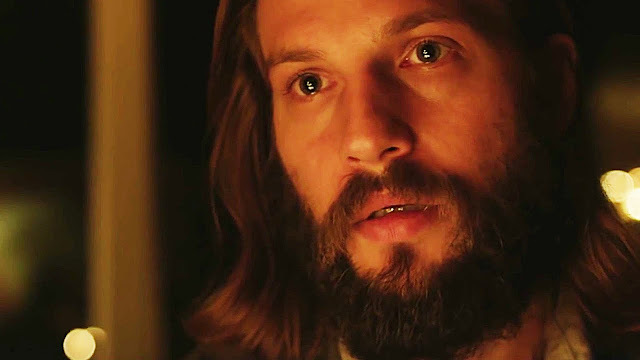 Will (Logan Marshall-Green) and his girlfriend Kira have been invited to a dinner party that his ex-wife Eden (Tammy Blanchard) and her new husband David (Michiel Huisman) are hosting. It has been two years since Will saw her and their old friends, so that coupled with the fact the party is hosted at his old house where their son died takes his toll on him. As the night proceeds Will starts to get more and more suspicious as to the intention of the hosts, but are his fears warranted or is it all in his mind? 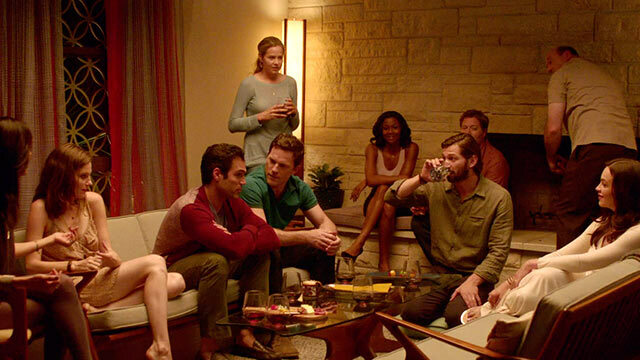 Aside from a few minutes at the start the entirety of The Invitation takes place at the dinner party over the course of one evening. For what is essentially a peaceful party director Karyn Kusama (Jennifer's Body) does a superb job of keeping the tension high. The editing and the score combine to create the feeling of hidden danger, a persistent threat that just doesn't leave no matter how many times it is dispelled. This is helped by the interactions between the different actors, the people Will knows from back in his life, and the strangers; odd behaving people that don't do a lot to get themselves liked by him. The whole group of actors are a solid lot, their interactions both intimate and awkward, none of them are bad, all seem to get along well which really helps in getting you invested in the story. The film follows Will and so it is hard not to get caught up in the suspicion and paranoia that seems to be festering inside him for no concrete reason. There are subtle little moments that seem to confirm his fears but more often than not these are cleared up down the line. A missing party guest who Will knows for sure did arrive, mysterious callers at the door, Eden and David's constant talk about a group they joined that helped them get over their trauma (and which others think sounds like a cult), all these are made to seem like huge things when maybe they are not. There are certainly plenty of red herrings thrown in, just enough that I was constantly going back and forth on if the only horror exists in the mind of Will. I also found amusing how near the films start they reference a home invasion at a house in the area, I did wonder if that was a dig at the glut of home invasion horrors out there. Disjointed, faded flashbacks are used to reveal Will and Eden's past, these were actually quite effective, I loved how the memories visibly effected him, rather than them being separate to the present day plot. 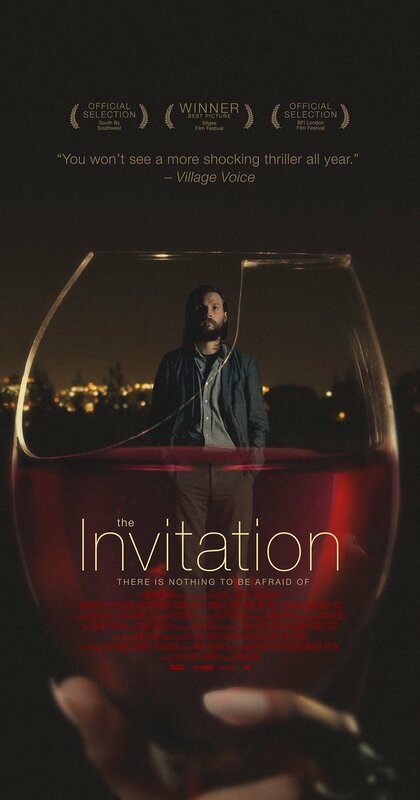 The most annoying thing about The Invitation is just how hard it is to talk about to people who haven't seen it, to go any more into plot would ruin the film. It is thrilling in it's own sedate way, but to call it horror? I don't know. For sure there is never ending tension and anticipation of terror to come, it is magical how that is sustained for so long, but people coming here looking for horror of a more visceral and physical nature may think they have come to the wrong place. Real life tragedies such as the death of a child, and the inability to move on from grief are what drives this film rather than any amount of home invaders. If you have the time for a slow burn, albeit one that is steeped in a boiling pot of tension and suspicion then I completely recommend this slick looking pseudo drama. It has its ham fisted moments, some may find the resolution to be unsatisfying, while the main lead is hard to be on the side of. Certainly an interesting and unique feeling movie.